In 2009, without having ever visited Bavaria, we moved from London to Munich, and we were shell-shocked. We'd stayed in Berlin, loved it. Stayed in Hamburg, loved it. Heard about Lübeck, Potsdam, Dresden... All these cities seemed alternative and edgy. As far as we were concerned, Germany was where it was at. So, when my beaux received a job offer from Munich, we didn't think twice. Little did we know (or expect) that Munich was in fact Germany's sanctuary of culture, tradition and conservatism. This basically translates to: quiet residential neighborhoods, large chain stores, a neat city center and a yearly celebration of traditional costume. Needless to say, it took quite a while to get settled. Actually, I think never really got settled, but, I have learned to love Munich. The thing is, if you like winter-sports, the Alps, sausage, sauerkraut & biergartens, Munich's the place for you. No-brainer. But, to the über-alternative, recklessly vegan, Berlin & Hamburg-loving urbanites: there is hope. Munich has many hidden gems, you just have to get yourself a treasure map. To help you get started, I've listed 10 of my favorite places in Munich. Check out photos, names and opening times right below, find the links (+ some bonus info!) at the very end of this post. Enjoy! 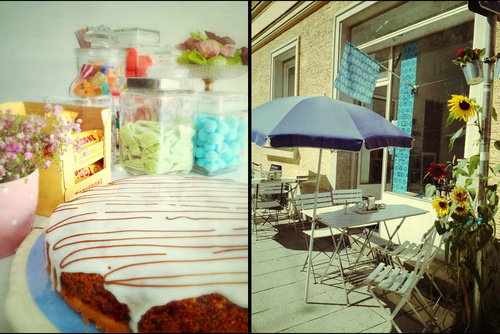 Enjoy lunch, coffee and a dessert in this gorgeous little cafe, hidden away in St-Martin-Strasse 9. Open on Tue.-Fri., 11:30-15. You'll find it on St. Bonifatius Strasse 20. Open on Tue.-Fri. 14-19 and Sat. 11-19. 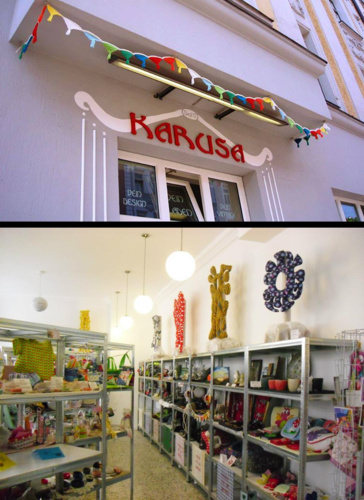 Karusa's a huge store where local artists and crafters can rent a shelf to display their wares. There's also a DIY wrapping-station and a (newly opened) second hand section in the back. A great place for inspiration- or giftseekers. Check it out on Humboldtstr. 6, Mo.-Fri. 11- 19, Sat. 11-15. 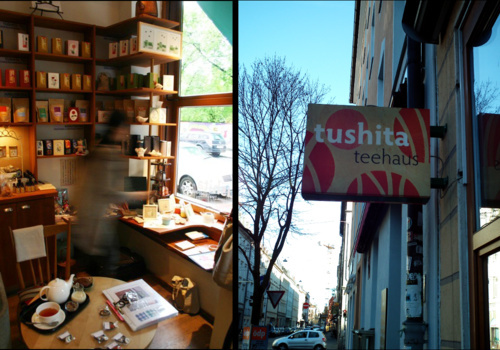 Tushita's a vegan café which serves Japanese food, glutenfree cakes and sells all kinds of tea paraphernalia. Simply heaven. You can find it on Klenzestr. 53, Mo.-Fri. 09-20 and Sat. 10-20. It's just around the corner from Tushita Teehaus, on Fraunhoferstr. 20. Open on Tue.-Fri. 11-19 and Sat. 11-16. 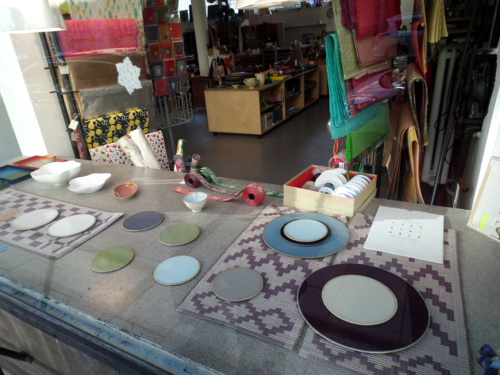 Or, go to the amazing animal, human and ecofriendly store DearGoods. You can shop clothes on Baldestr. 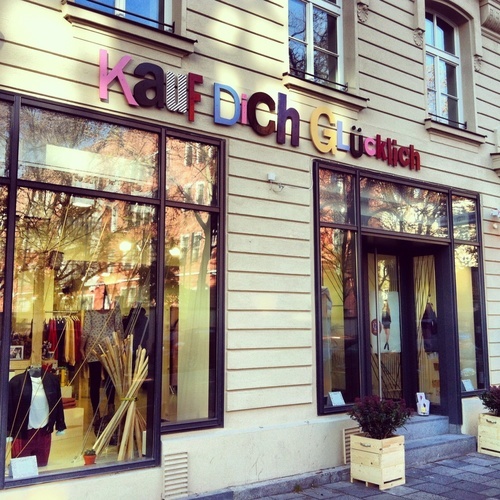 13 and gifts on Baaderstr. 65, they're literally 5 minutes walks away from each other. Open on Tue.-Fri. 11-19 and Sat.10:30-18. Chocaholics, we're ready for lift off! 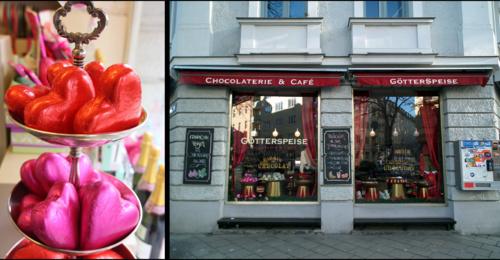 You'll find everything your heart desires in Götterspeise (literally "ambrosia"). Delicious & sinful cakes, teas, chocolates and other delicacies. This gorgeous little café is a must-nibble! Find it on Jahnstr. 30, Mo.-Fri. 08-19 and Sat. 09-18. This shop does exactly what it says on the tin (literally "Buy Yourself Happy"). 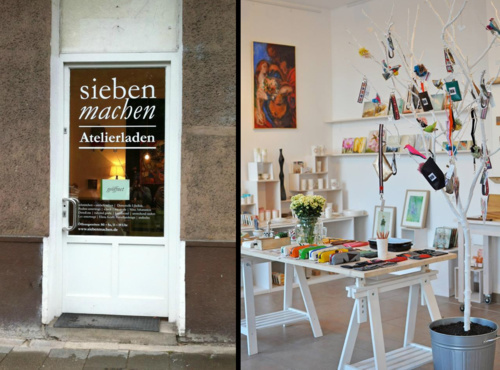 If you find yourself in need of some retail therapy, this may just be the place for you: Schellingstr. 23, Mo.-Sat. 10:30-20. 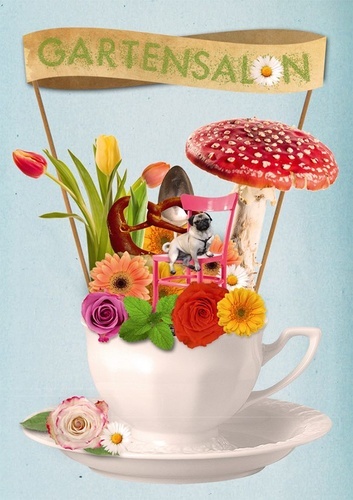 The Gartensalon is without a doubt the most creatively satisfying café in Munich. Gorgeous, home-made food meets an impressive candy counter meets local art and design. Here, you can feast your eyes on both food and art, at the same time. What more could you want? Türkenstrasse 90/Amalienpassage. Open on: Die.-Sat. 09-19, Son. 10-19. Thanks for reading and do let me know if you visit any of these places, deal? Deal. Did you like this post? Share the ♥ with your wonderful friends! Please use the icons below, thanks! Posted 5 years, 2 months ago. Nice places, I knew some of them and the others are now in my list! Thank you for sharing.